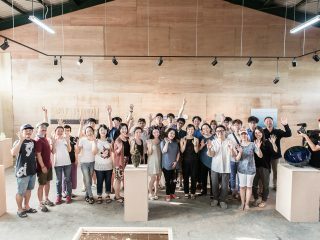 Sokcho is a coastal city that gained a bit of international fame this past summer thanks to a small glitch that allowed expats and Koreans alike to join in on the Pokemon Go craze that was inaccessible nearly everywhere else in the country. 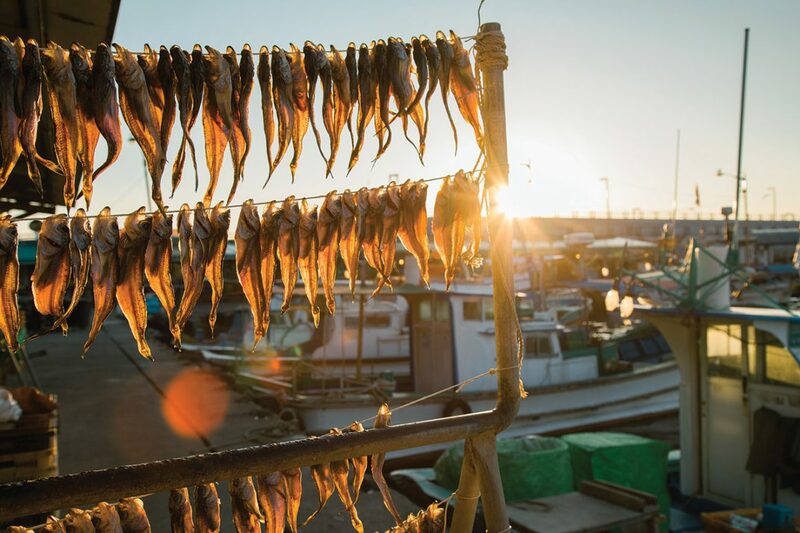 Prior to being thrust into the Pokemon spotlight, Sokcho was just another quiet coastal town in the far northeastern corner of South Korea that likely saw more tourists making a rest stop on their way to Mt. Seoraksan than visiting with the sole purpose of touring the streets. This is a shame, because Sokcho offers a far more tangible and delicious prize than digital monsters: namely, delicious food. For those residing in Seoul, the trip to Sokcho can be undertaken with relative ease by taking one of the buses leaving from Dong Seoul Terminal. Outside of Seoul, however, getting to Sokcho can be an adventure in and of itself that often requires catching the one or two daily buses that make their way directly to the city or transferring in Seoul and making your way up to the coast. This can often lead to tired travelers and late arrival times, but given the task ahead it is best to start off the trip with a bang and head directly to the first destination, Dongmyeonghang Port. Here, you will find an entire street lined with restaurants, but the real goal should be settling into one of the multistoried restaurants selling a variety of crustaceans. When in doubt, follow the giant illuminated crab. Like many of the freshest seafood restaurants across the country, the first floor of this building is set aside for selecting the particular crab or lobster that you want to have served to you upstairs. The workers here suggest snow crab as a popular choice and usually about a kilogram of crustacean per person makes for a satisfying meal. Granted, this doesn’t come cheaply, but given the extra preparation and service that goes along with the meal – not to mention the unlimited sushi and side dishes – the modest premium over straight market prices is worth it for this occasional treat. 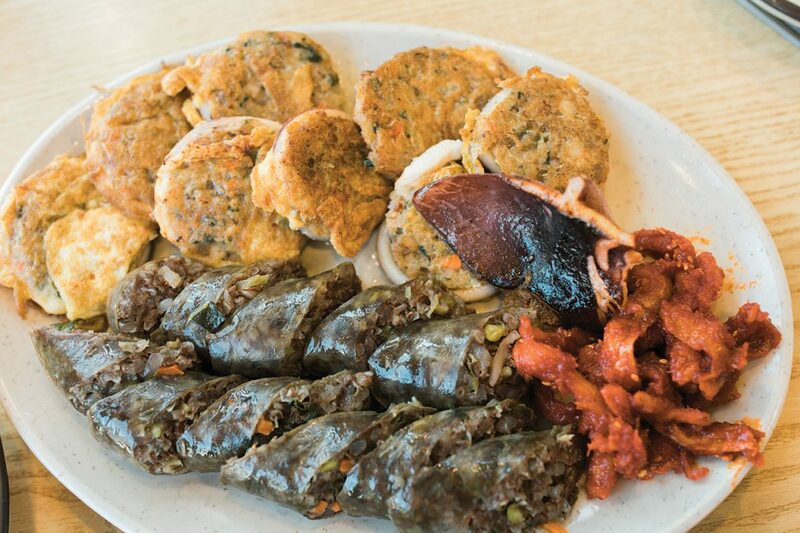 Upstairs, your table is served with a range of side dishes that include some of Sokcho’s other famous dishes, including mulhoe – raw fish in a cold watery broth reminiscent of cold summer noodle dishes – and squid sausages, or ojingeo sundae. 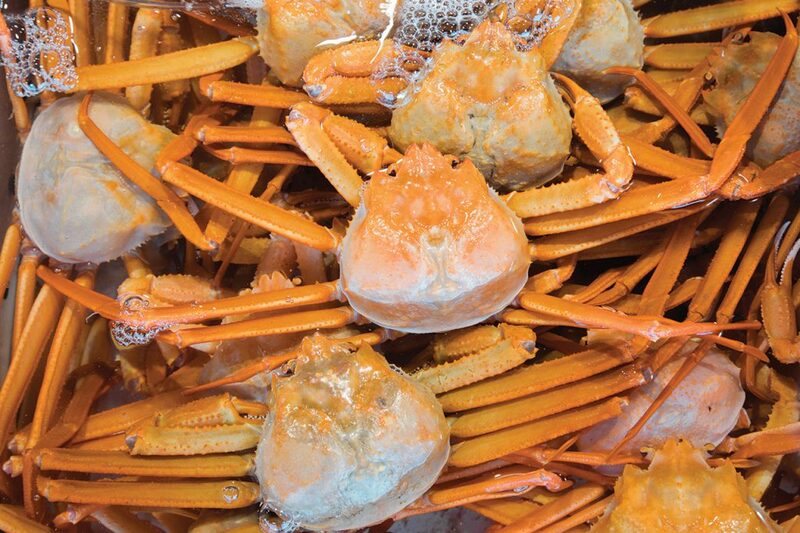 Best to save room for the crab, which comes along soon enough and is cut in just the right way, making pulling apart the shell an easy task even for the tiredest of travelers. The body of the crab is served with the “juices” of the crab still intact, which doesn’t make for the most visually appealing dish but is quite tasty when mixed with rice, which the servers will happily do if asked. Once the crab is gone a pot of hot crab ramen is perfect to top the meal off and perhaps enjoy with a drink or two before heading back out into the cold. Sure, after a long cramped bus ride and a big meal the night before, waking up early to catch the sunrise along the coast might not be everyone’s top priority when they visit Sokcho. Still, not only can the view be worth it in and of itself but rubbing shoulders with fisherman and busy market workers stirring to life can better set the mood for the day of food ahead, and a morning walking around the beach is always a surefire way to work up an appetite. As far as coastal views go, you can’t do much better than the view back at Dongmyeonghang Port. 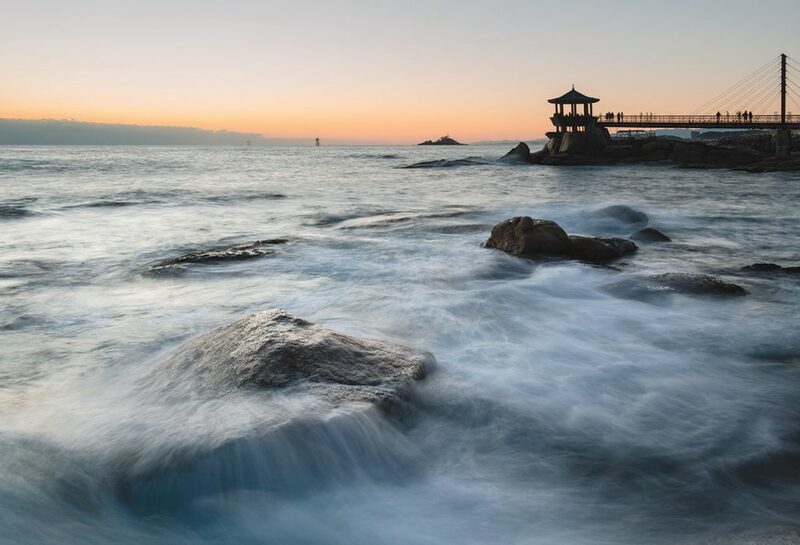 Here, you will not only find the Sokcho Lighthouse observatory, which provides a nice elevated view of the city and towering Seoraksan in the distance, but also the picturesque Yeongguemjeong Pavilion, which sits on a rocky shore that attracts photographers and fishermen alike. After spending a couple hours greeting the sunrise and making your way across piers, docks and endless racks of drying fish, you will likely be ready to start off the next stage of your culinary adventure. Without question the next spot to hit is Abai Village in Cheongho-dong. 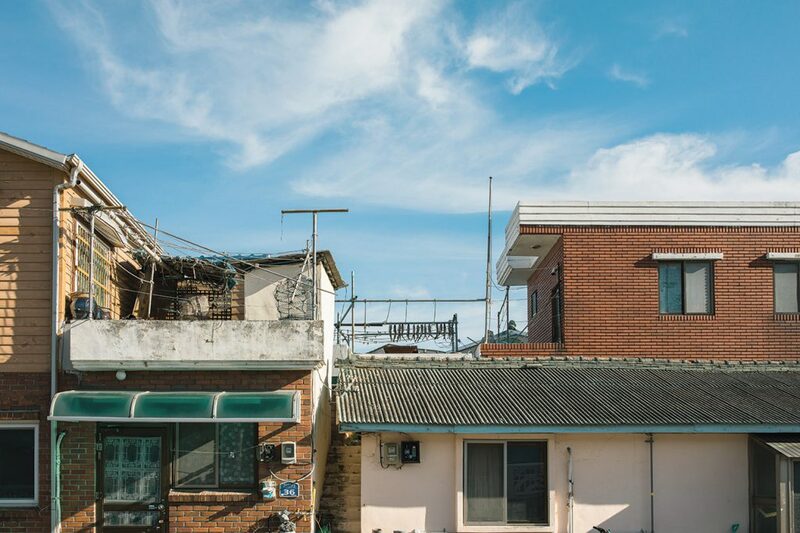 The village is named Abai after a word in the North Korean Hamgyeong-do dialect meaning “an elderly person.” This became the name of the town after many elderly North Koreans fled to this area during the Korean War and took up residence. With these residents from the North came their own culinary traditions, including the main draw of the village, ojingeo sundae. 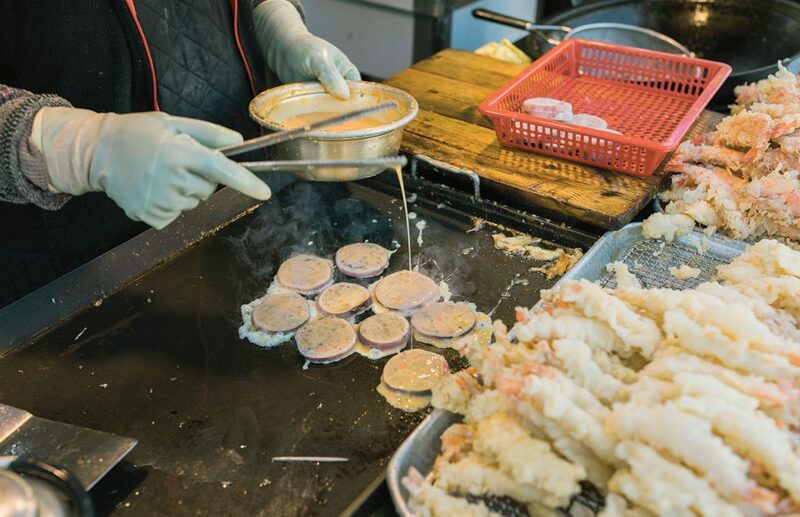 Step into one of the storefronts along the village street and sit down for a plate of ojingeo sundae, which is, quite simply, a squid body stuffed with fairly standard sundae ingredients and then, depending on the store, pan fried in egg or served whole. This can be eaten in combination with abai sundae, which looks like more traditional sundae but differs by foregoing the glass noodles for extra vegetables and glutinous rice. Both of these go deliciously with a single wrap of sesame leaf kimchi. 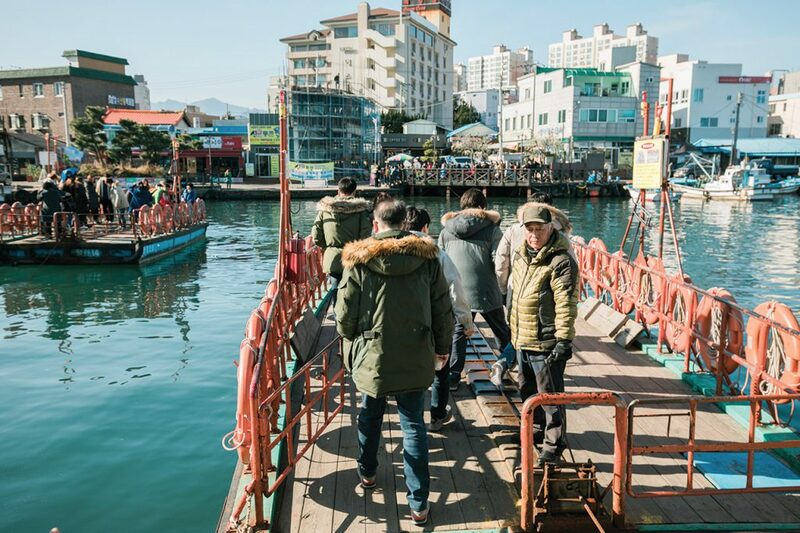 After filling up on sundae it’s time to make your way over to the small floating ferry that takes you two minutes across an inlet and lets you off in front of Sokcho Jungang Market. Sure, you could take the long way around and avoid the 10-minute or so line to the ferry, but doing so doesn’t save any time and the ferry, which only costs KRW 200, is part of the adventure. 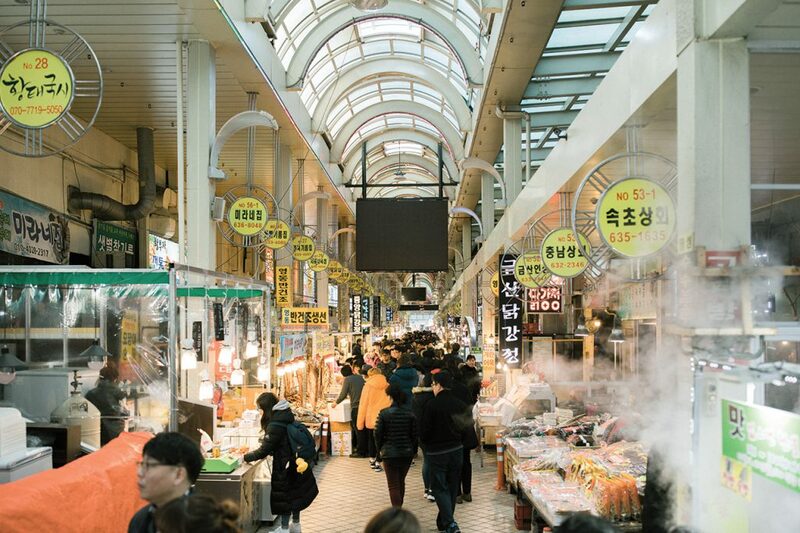 Once at the market you will be faced with what must be one of Korea’s larger traditional markets. Lining the narrow passageway is stall after stall filled with the day’s catch of fish and the many women who keep the market running. Many stalls will pack their product on ice in a styrofoam container for transport, and some will even ship directly to your home. Almost counterintuitively, however, the real headliner in this market is the original Manseok Dakgangjeong chicken store that sells countless boxes of pre-packaged seasoned chicken and, according to one resident, has been Sokcho’s most profitable business for the past 10 years. Luckily, this chicken is packaged to be carried out and, according to the workers, is better once cooled. After a day filled with fresh ocean air, plenty of walking and plenty of delicious food, it’s finally time to make your way back over to the Sokcho Intercity bus terminal. Try to arrive a bit early and stop by the delightful Jineurumi coffee house for a little caffeine boost or one of the beer or cocktail options to relax a bit for the long bus ride ahead. STAY> Motels, guesthouses and hotels are abundantly available around both the Express and Intercity bus terminals, but make sure to reserve ahead. 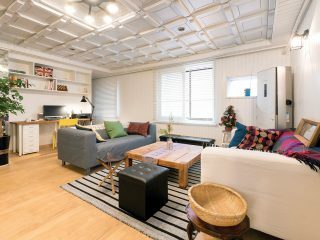 With U Hotel and Guesthouse, located across the street from the Express Terminal, is a newly opened hotel-styled guesthouse that offers small but very clean private rooms for KRW 70-80,000 a night and dormitory style rooms for KRW 20-30,000 depending on the day. Also available are a theater and common area in the basement and a self-service kitchen and lounge area on the fourth floor. GO> Buses to Sokcho depart from Seoul’s Express Bus Terminal or Dong Seoul Terminal (travel time: 2 hours, 30 minutes).